Today I am back with another book review because Melisser’s book is finally out! It’s called The Vegan Girl’s Guide to Life and it is fabulous! It is a book about everything that you might want to know when going vegan. Melisser’s book covers nutrition, vegan living, shopping, vegan food and of course it includes lots of delicious recipes. Melisser tells you how she went vegan and what a vegan is. There’s a wonderful paragraph on why honey isn’t vegan and another great one on how to answer questions from non-vegans. In the nutrition section you can get tips on how to get your protein, calcium, b 12, and iron. The chapter also answers some questions about soy, vegan exercise, and about the connection between health and veganism. The chapter “Vegan Living” is about eating out, the vegan community, companion animals, and traveling. In the chapter about shopping you will find a ton of tips how to shop not only for food, but also for shoes and clothing, make-up, beauty and cleaning products. Melisser did all the research for you and gives you many tips on where to shop (the companies are mostly based in Northern America) for your favourite products. 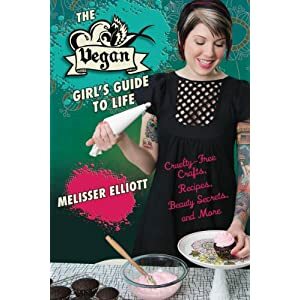 In the chapter on food, you can learn how to make your own vanilla extract or how to frost and decorate a cupcake, how to replace eggs and other non-vegan ingredients in baking and cooking, and how to feed a non-vegan. There are also some really great DIY projects, like this one. As you’ve seen by now, The Vegan Girl’s Guide to Life covers many aspects of the vegan lifestyle. It is a great book for everyone going vegan (not only girls!) and it’s also a great book for long time vegans. In my opinion the best part about this book is that it is all about the vegan community, about friendship and dedication. Melisser includes interviews with fellow vegan bloggers, with vegan business owners, and vegan friends. This is so great because, in my opinion, it tells you so much about the vegan lifestyle. It’s not only as cruelty-free as possible, it’s also about making the world as vegan-friendly as possible, it’s about meeting new friends through veganism and about living a compassionate lifestyle. It sets such a good example that vegans are not a grumpy bunch of people whose life is hard and miserable because they have to sacrifice so much. Instead it’s about being positive, broadening one’s horizon, getting creative, and of course, making your own cupcakes. In the recipe section, you will find not only recipes by Melisser, but also by other vegans, like Celine, Hannah, Jenn, or Kittee. I tested some of the recipes and really liked all of them. They reflect the richness and variety of vegan food and they vary from simple to elaborated. This pasta dish was perfect during asparagus season. I used fresh white asparagus which matched so well both with the pasta and the sauce. Melisser’s lentil soup was way beyond basic. I reminded me of the lentil soup served in my family, flavourful and filling. Kittee’s mac and cheese was the best mac and cheese I ever had. So, so, so good! It’s smoky, people! The cake sounds great – what interesting icing! I am hearing lots of good stuff about this book on the interwebs. I shall have to check it out for myself! thank god for nutritional yeast! Your cake looks so good! :) I can’t wait to check out the book, too. Thanks for the review. I have seen a lot about this book lately and know I really want to get it. Especially for the mac n cheese and your cake. Thanks! I can see I still have many more recipes to try from this book… Thanks for highlighting what sound like keepers! The publisher asked me if I wanted to do a review. Of course I said yes. But they never send anything or answered my mail. Kinda rude. But anyway, I probably end up buying the book and now I know there is a recipe from you in it, I’m sure I will. Sounds fun! I happen to think that the key to perfect mac n’ cheese is a little bit of liquid smoke–so I’d love to see Kittee’s recipe! liquid smoke, chipotle and smoked salt X3! Great review, and look at that cake! Hey, I remember testing that cake recipe. It IS good! I am so intrigued by Kittees Mac and Cheese! Bragging is totally allowed, especially when it’s about the publication of a cake recipe that looks amazing! Yay, Mihl! That cake is beautiful! I love the book too :) I can’t wait til asparagus season to make that pasta. Sadly it is a long way off. I can’t wait to get my hands on this book & your almond lime cake recipe. Great review! I recently got this book and am just starting to dig in. This book is so valuable to me as I am still learning the non-food aspects of veganism. All of those recipes that you tested are so tempting, and I need that lentil soup in my life!